Oh, and I forgot to mention. We had this problem in our kitchen that our huge heavy cast iron pots and pans, plus a big ol’ wok, all were kept clumsily on our back burners for a lack of other place for them. So, this weekend I looked on our porch and saw we had a long sturdy plank, so I built this to keep them on. (I still might add an extra brace in front so it can’t topple forward, and if I’m REALLY inspired, i may paint it). I like building things. See? Happy shelf. I just discovered Spacetrawler, and spent the last couple weeks going through the archives. I’m really looking forward to the next part of the story. But, really, a wooden frame right next to an open gas flame? Are you sure you don’t want to at least wrap the lower portion in aluminum foil? For the braces, use 2 short 45degree angle braces screwed into the back sides and top, that should provide enough structural support, while limiting the space required. Position them halfway between the long edge of your back pieces, and the corners. Also, do not use ‘corner’ shunts (triangles) as they will not be very effective. ALSO: I have read every single page and post for the past few years when I discovered this, and this is tied with wapsisquare for my favorite comic both wen and print, ever. Thank you for making our lives much more enjoyable, and for all your years of blood, sweat, and tears. Looking forward to the new story! So very channeling Mr. Zorilla there in panel 13. I was so totally going to say that! I thought he was doing John Kerry. I just discovered and read through Space Trawler over the past two days. It feels as if I have packed a year or more into that time. A long and twisting ride. An epic! I have been personally enjoying these self-portrait comics. 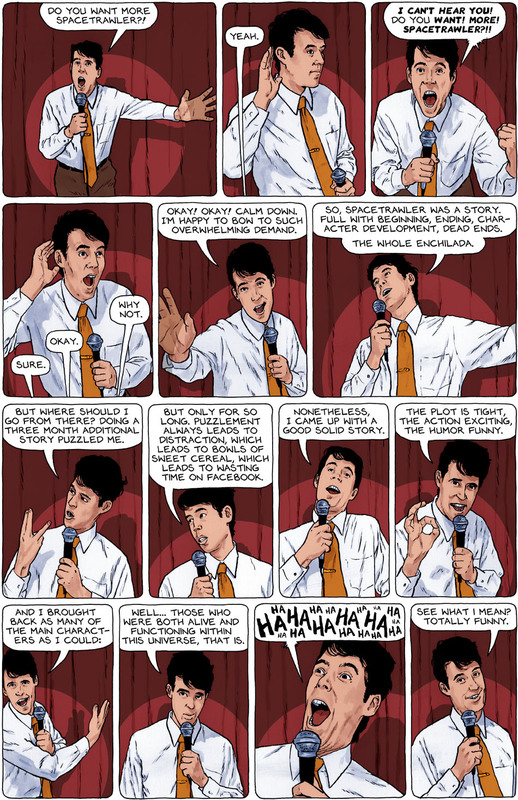 Did you videotape yourself giving a speech? Snapshots? Mirror at least? These are awesome. I can SEE the action, hear your voice (and the other voices in my head are jealous). Also, when you laugh it reminds me of Martina’s dad. I do worry about your pot shelf, it’s wood and after awhile the bottom side will become coated with grease from cooking, an if you have a flair up from when cooking it could catch fire and burn rather nicely…. In boats there are things called fiddles that stop dishes and such from sliding off shelfs, tables, and such. They are strips of wood on the table that provide a raised edge all around the table except at the corner (so you can clean them and spilled liquids can flow off the table). Keep up the good work, MORE SPACE TRAWLER, MORE SPACE TRAWLER, MORE SPACE TRAWLER, MORE SPACE TRAWLER… listen to the crowds chant……. What *is* the deal with Spacetrawler? You could maybe put hooks on the wall and hang those pots from the handles? then no issues of potential burning! I do think the shelf idea is cool though, just maybe it needs protective coating. Also, if you’ve never made tang-zhong bread, I think you should check it out. Chris, judging form panel 13, I have to believe that you were the inspiration for Mr Zorilla’s impossibly long face? I love Spacetrawler. It’s the first thing I browse to on Monday and Wednesday. Thank you so much for keeping it going for a few months more. Helps with the withdrawal symptoms. Oh and the same goes for Little Dee and Bruno. You’ve limited airflow to/from your range hood by positioning your shelf there, and as someone else mentioned, you’ve put two pieces of soon-to-be-greasy wood about two and a half to three inches from an open flame. Be safe! We love your work! Channeling Martina’s dad? Nah. Mouth can’t open wide enough. Hopefully that won’t stop The Christopher from continuing spin-off stories though, particularly since there are plenty of interesting non-human characters. Hey, it’s not always about us Terrans, y’know? The cabinet above the stove is FINE. Don’t listen to these safety rangers. DON’T use wood over that stove, unless the back burners don’t work. As for stability, I can’t see any, but you may want to anchor it to the wall wil “L” brackets so it won’t tip over…IF you are still going to use it. You are much cuter in your photos than in your self-portaying. Not to be critical, but just to be supportive; add a strip, back plate, to the back of your self. about three to four inches wide that runs from one side to the other and attach it on the back of the sides and along the back of the top shelf. This will act as corner gussets for boths sides, tighten up and stabilize the whole structure and then put a couple of fasteners through the back plate into the wall behind the stove, solid man, solid. Love the cast iron dude, the only way to fly…erm…fry? I don’t think the wood will catch fire, although it might char eventually. I agree with the suggestion of anchoring to the wall, however; in my house the cats try to pull things like that over, and often succeed. They like getting books off my book shelves but instead of reading them they leave them on the floor. I don’t know what they’d do with an flying iron Dutch oven. Indeed, depending on the wall, you might consider attaching the shelf to the wall instead of supporting it at the sides. I had no idea my woodworking would spark such debate! I am not worried about it blocking air flow for the fan/vent. We almost never use it, and I have already tested it (steam from pasta last night) and the interruption is negligible. I might actually put some metal on the inside of it to keep it from catching fire (which I don’t think would happen, but better safe than sorry). And grease won’t protect it because we don’t build up much, as we’re both vegan and don’t cook with much oil, but maybe a painted coating instead of metal. The reason I’m planning on side braces (rather than a back anchor) is that our lease asks us to not make holes in the walls (and the walls are old, require anchors, and are not terribly strong). Maybe I can find a couple of old iron legs from a sewing machine or something. That would be cool. That second to last panel has you looking a bit like Martina’s dad. Hahaha! Maybe steal legs from a bakers rack, or even one of those bathroom shelf units (think long enough) and angle them out just enough to keep the whole thing against the wall. The junkyard, or the local Habitat For Humanity Re-Store (check weekly, always changes) may yield some ideas and some useful bits, for cheap. Leave room for the covered can of baking soda, where you can get it and dump it on a flaming skillet or casserole. Saves the meal, and the kitchen. It may taste a little funny, but is still safe to eat. Ah, the dreaded Lease Restrictions. 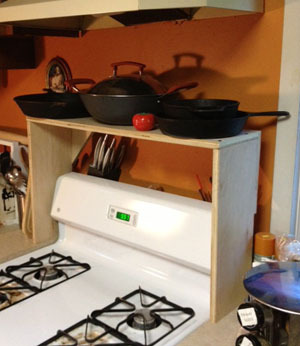 A cantilever shelf screwed into the studs behind the stove would have worked otherwise. Ha Ha HA Ha Ha Ha HA HA HA HAHaHaHaHaHA indeed. Why not utilize the sides on the rear of the stove (where the knobs and/or clock are normally located) to secure it instead? Surely there’s already a few screw holes there to keep the plastic cover on, just find where they are and use longer screws that go through the shelf as well. Perhaps if you were feeling industrious, drill a few extra holes for good measure. If the stove is part of the lease (you never know), keep the original screws and just use existing holes…if you ever move, take your shelf with you and replace the original screws. No holes in the wall, no bracing cluttering up the walls, and it’ll be nice and solid! That wood may char, but never ignite. Use some L brackets to brace that shelf and keep it from wobbling. You could secure it to the wall using Velcro strips which will peel off when you remove the shelf. Really pedantic BUT shouldn’t we be asking for more “greased-dark-light-drive” instead. Y’know, ‘cos spacetrawlers were all inhuman / insentient ‘n stuff. As to the hardware … guys, don’t give the vegan ideas, hell turn this strip into tool-time which is such a sad series of injokes. PS .. Love the talking head comic effect. Droll dry humour can be such fun.